Simon Greer discussing what he learned from an experiment in dialogue across difference. 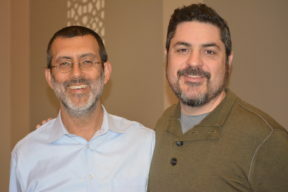 When the phone began to ring off the hook after the November 2016 election with calls from rabbis and cantors, trained by JOIN, looking to strategize, it became evident that our rabbinic and cantorial alumni would need particular and different types of support and training to help them organize and lead in this political moment. This month, we held our first clergy gathering since 2012, designed to address the particular questions that our alumni said they needed the most help grappling with. Over 60 rabbis and cantors from around the country came together to learn from leading trainers and thinkers as they asked questions such as: How do we understand, and teach our members about anti-semitism, white nationalism, and white supremacy? ; How do we navigate the current tension between Jewish and other communities, and within our own community, over issues such as the Women’s March? ; What can white clergy learn from working respectfully with Jews of Color and non-Jewish clergy of color? ; In politically diverse synagogues, how do I challenge those ready to organize for justice while still engaging and respecting those who disagree? ; What can happen – for ourselves and the country – if Jews engage with other communities who disagree with us politically? ; How will our theology of organizing shift in this moment? ; and, how do we sustain our own leadership and nurture our souls while doing this vital work? Eric Ward presenting on anti-semitism in white nationalism and movement spaces. 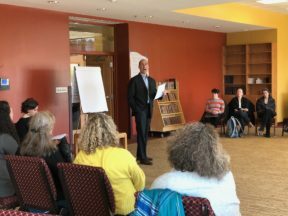 Eric Ward, author of “Skin in the Game,” presented on anti-semitism in white nationalism and movement spaces, and challenged rabbis and cantors to not shrink from engaging it publicly. 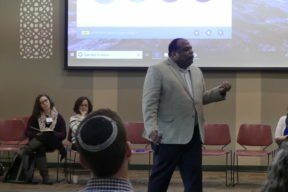 April Baskin of the Jewish Social Justice Roundtable delivered an eye-opening presentation on how to close the widening gap between Jews of Color and white Jewish leadership. She offered us a set of tools to help clergy interpret how different people react to varying degrees of oppression and how to navigate one’s way through them. April Baskin breaking down her oppression hypothesis. Tru’ah’s Rabbi Jill Jacobs spoke to the question of clergy having a clear, moral voice in times of political turmoil. She said we should rely on our own personal insight when crafting our own moral voices. Rabbi David Jaffe honed in on the use of Mussar, and other spiritual technologies, such as spontaneous prayer, visualization, and meditations that can be used to cope in times of crisis and spiritual struggle. Additional speakers included Megan Black and Rabbi Amy Eilberg of Faith in Action; Simon Greer, a thought leader on common good politics and founder of Cambridge Health Ventures; Rabbi Mordechai Liebling, founder of the Social Justice Organizing program at the Reconstructionist Rabbinical College; Rabbi Shuli Passow, Director of Community Engagement at B’nai Jeshurun in New York City; and members of our current Clergy Fellowship program and other alumni of JOIN’s training. We were able to capture some brilliant reflections from the attendees, and we’ve compiled them below in this playlist. Check it out.